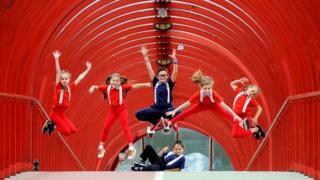 More than 6,000 dancers from 30 countries are in Glasgow for the start of World Street Dance Championships. The three-day event is due to get under way at the Scottish Exhibition and Conference Centre and the neighbouring Clyde Auditorium. Almost half of those at the event will be competitors, aged between five and 30, while the rest will include coaches, family and supporters. Glasgow has secured the right to host the event for the next three years. As well as the world championships, Glasgow is also hosting UDO Scottish National Schools Street Dance Championships and the festival Dance Show Live. It is estimated the events could add an extra £7m a year to the city's economy. Scott Taylor, chief executive of Glasgow City Marketing Bureau, said: "This weekend marks the start of Glasgow's reign as the global home of street dance over the next three years. "The United Dance Organisation's decision to bring their flagship event to Glasgow is a huge vote of confidence in the city and one which reflects the standout success and continuing growth of our tourism sector as well as our cutting-edge style credentials and our reputation for winning and delivering major events. "The World Street Dance Championships are incredibly valuable to Glasgow, especially when you consider that more than 80% of attendees will come from outwith Scotland, providing a significant boost to our economy."